Mozilla just released its annual financial report for 2011, as well as the annual “State of Mozilla” report by the organization’s Chair Mitchell Baker. According to this report (they traditionally arrive at this time of the year), Mozilla’s total revenue (including the Mozilla Foundation and all of its subsidiaries), was $163 million. That’s up about 33 percent from the $123 million it reported in 2010. The majority of this revenue, the organization noted, still comes from Google. 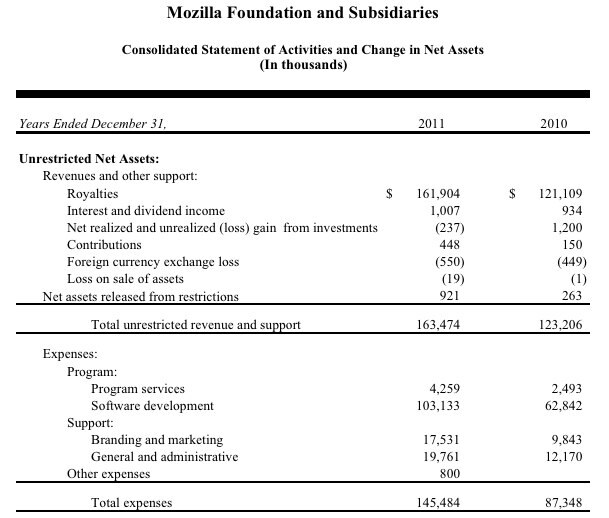 Mozilla’s total expenses for 2011 amounted to $145 million. You can find the full financial report here (PDF).